Winks & Daisies: Oh. My. Cuteness! As a designer you wish that new ideas would just "click" into your head and off you go designing. I think I'm safe to say that just as any other designer you have to go browsing for inspiration. Sometimes I can lose myself in blogs and sites and before I know it hours have gone bye. I have to do it time to time though since it really does strike up new ideas. This weekend I'll have too buckle down and get my designing on. I've been asked to design a few more themed announcements/invitations for Pea Pod Announcements that will be carrying more of my designs. Yay! 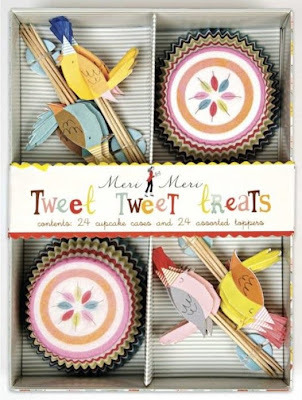 I stumbled across these super cute birthday cupcake kits by Meri Meri. I've been a fan of Meri Meri for a while after spotting a few of their cards and other goodies in paper stores. I first spotted these kits on this blog site. Worth browsing!